Saint Francis Medical Center has been named a winner of the Women’s Choice Award: America’s 100 Best Hospitals for Patient Experience. Saint Francis is the only recipient in Cape Girardeau County. As the only national honor that focuses on female patient satisfaction, the Women’s Choice Award signifies women’s preferences and outstanding clinical performance, and shows a commitment to women’s health. The scoring process focuses on female patient satisfaction. First, hundreds of women are surveyed. Then, the survey determines which questions in the Hospital Consumer Assessment of Healthcare Providers and Systems (HCAHPS) survey are most important to determine their satisfaction while they were treated during their hospital stay. A weight is given to each of the most important questions. In 2017, the most weight is given to those regarding the patient’s willingness to recommend the hospital, doctor and nurse communication, staff help, pain management, cleanliness and explanation of medications. Each of the responses to the questions are weighted accordingly and result in a numeric score for each hospital that reported valid HCAHPS data to the Centers of Medicare and Medicaid Series. The scoring is totally objective. When women make more informed decisions for themselves and their loved ones, they confidently choose Saint Francis Medical Center. 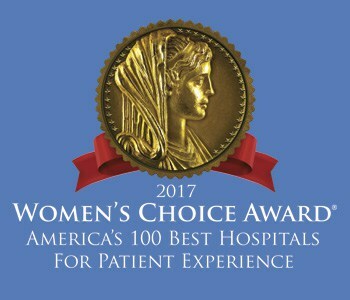 To learn more about the Women’s Choice Award: America’s 100 Best Hospitals for Patient Experience, call 573-331-3996 or click here to visit their website.